Diego Rivera (1886 – 1953) was a prominent Mexican painter, mostly known for his murals, or frescoes. Most of his murals carry social or political messages. Rivera’s political views were on the left side of the spectrum, and it showed in his art. Whatever his political views were, his murals are profoundly interesting to watch and read. Some of them have complex stories embedded in them – sometimes the history of a whole country or a continent. Diego’s life was turbulent and anything but boring. He was married multiple times and had his share of lovers. Hist third wife was Frida Kahlo, also a prominent artist. Despite infidelities on both sides and a brief divorce they remained together for about 25 years until Frida’s death. At some point Rivera was close friends with Russian exiled revolutionary Leon Trotsky, who even stayed at Diego’s house for some time upon his arrival in Mexico. There were rumors of Frida and Trotsky having an affair at that time. Murals are a special kind of painting. They are supposed to be seen by multitudes of people, often in the open urban space, often from a large distance. The level of detail, the laws of perspective, the light and color, the arrangement of space are different than on a regular framed canvas. The technique and the style are different too, bordering those of a cartoon or a poster. I am not in any way affiliated or involved with Lynda’s business, and this recommendation is just an honest reference from a happy customer. 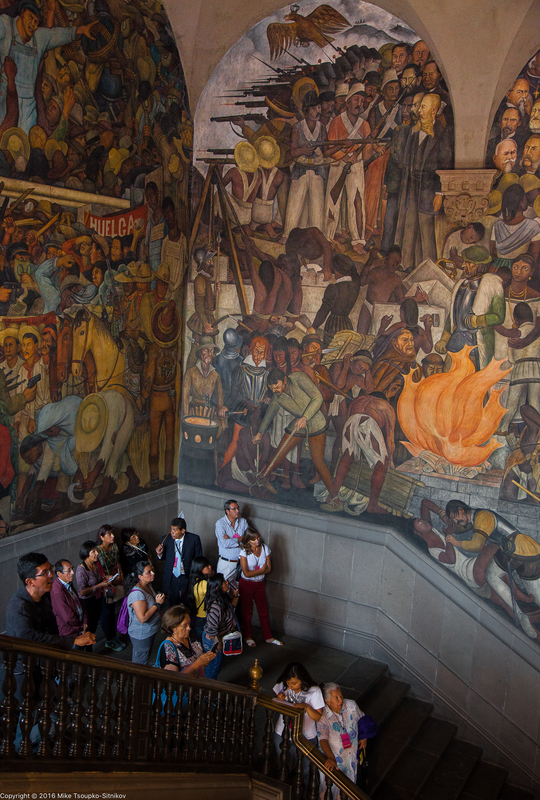 The first place to look for Diego Rivera’s murals in Mexico City is the National Palace. 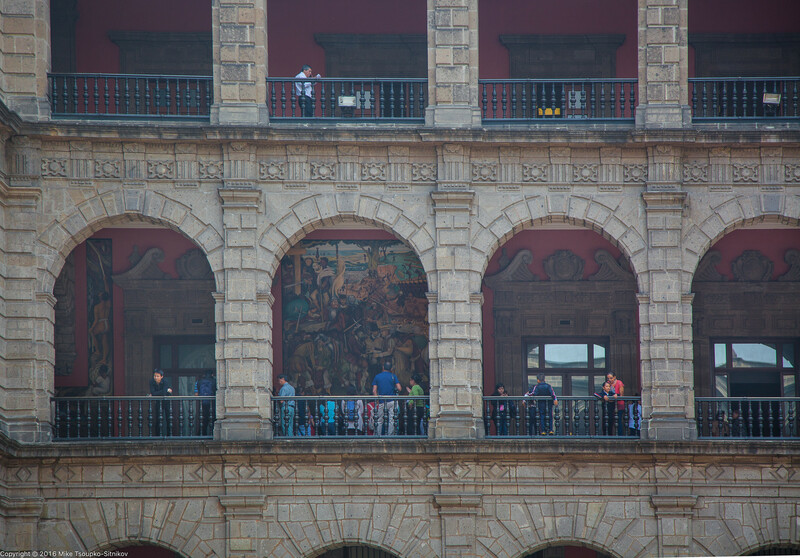 The Palace is located at the Zócalo Square and is open for public at certain days and hours. One can read this mural like a history book. And it leaves no doubts about the painters views and biases. 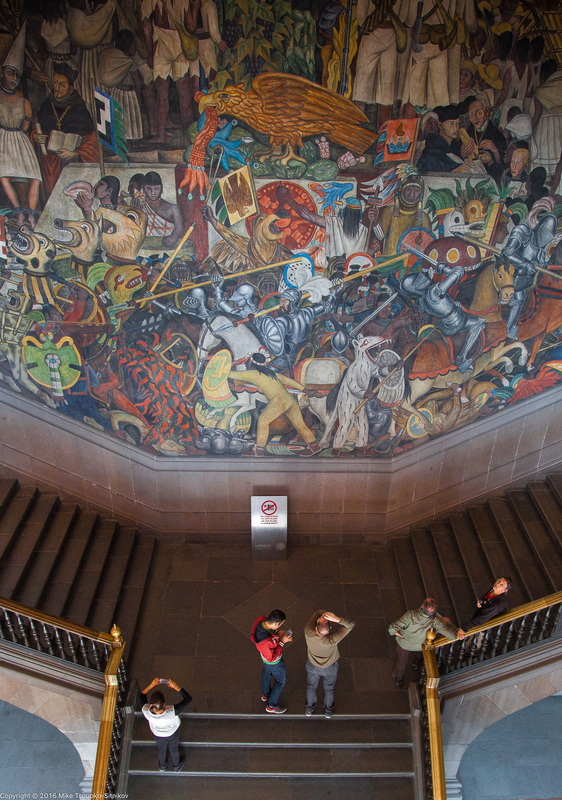 Proceed along the 2nd level gallery of the Palace to see more of Rivera’s works. And this one depicts the life of pre-Colombian Mexico. Note how much information it contains: city planning (in the backdrop), a Temple, various occupations, objects of arts and crafts, traditional crops and food. Check out that standing woman in white in near bottom right corner that is being courted by surrounding men – she has Frida’s face. 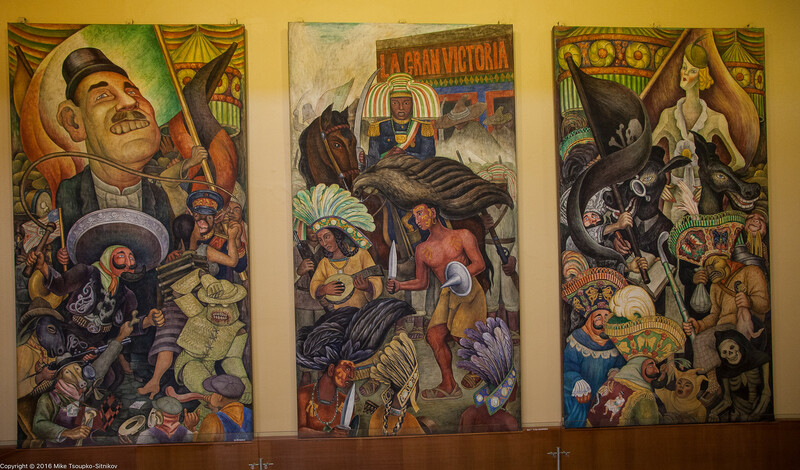 Most of Rivera’s murals in this gallery are painted not directly on the walls, but rather on large removable panels. 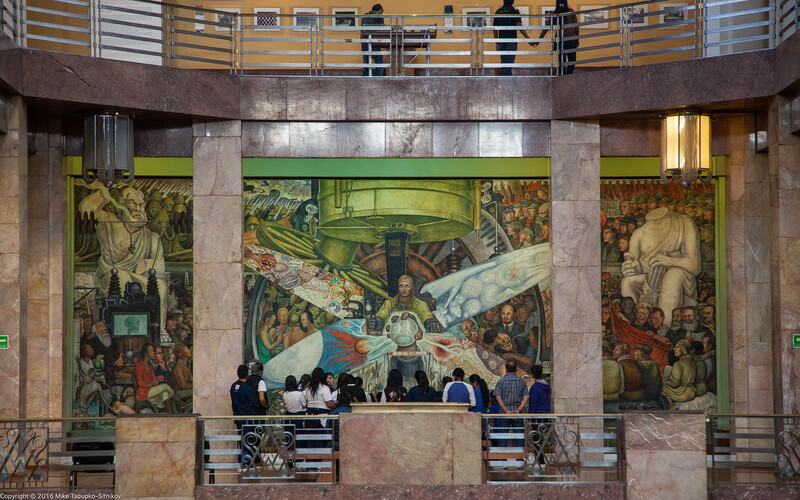 It is said that he started using such panels after the major fresco that he painted at the Rockefeller Center in New York City was rejected due to the figure of Lenin in it. 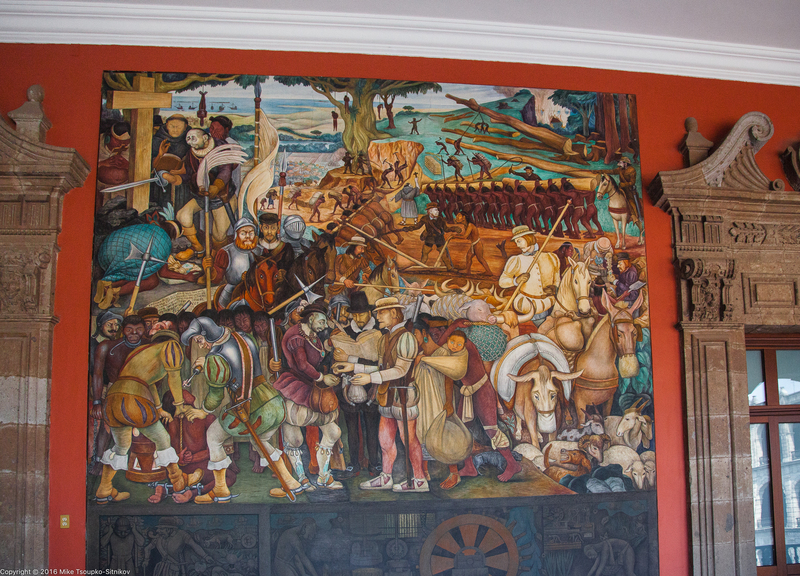 Rivera could not take the mural back home with him, and it was destroyed to his dismay. With the panels he could take his works from one place to another. 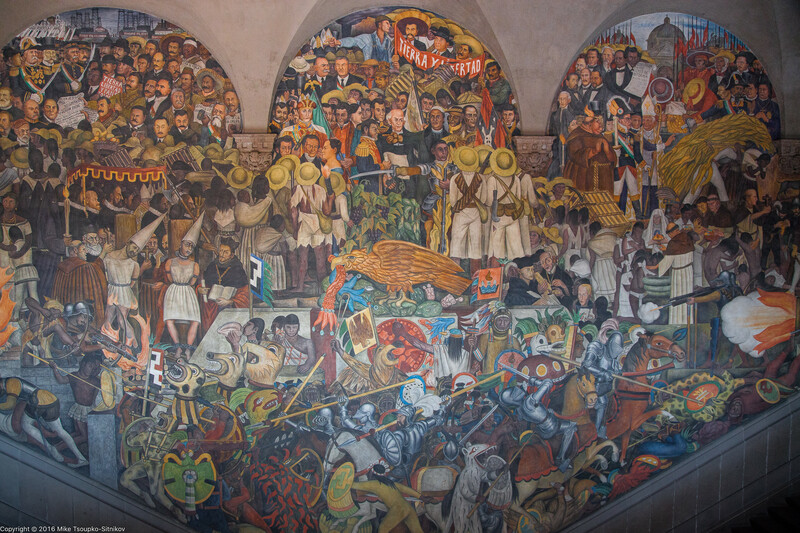 To see more paintings by Rivera we shall go to Palacio de Bellas Artes. One can actually walk there from the National Palace by crossing Zócalo Square and taking Calle Madera all the way to Avenue Juárez – the whole walk is about 2km. 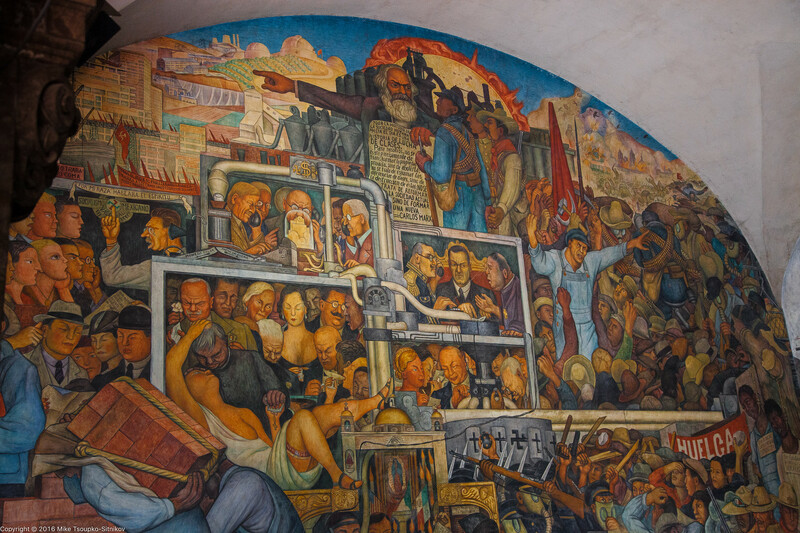 Many of the style elements used by Rivera in this fresco, especially those showing the working class people and the power of science, can be also found in the Soviet poster and mural art of 1950s and early 60s. This is the close-up of the right-hand part of the Man at the Crossroads. Note the rallying working class masses. The headless statue symbolizes the rise of fascism in the 1930s’ Europe. Next to it you’ll find another painting by Rivera featuring a Bolshevik rally. 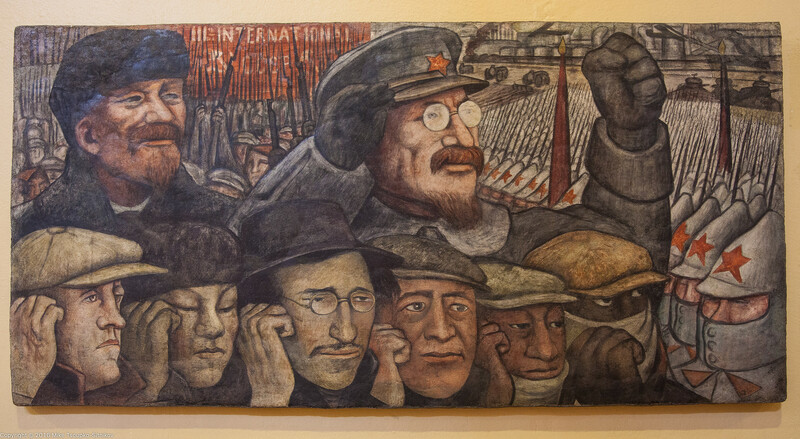 Note that it shows Lenin and Trotsky, while other Soviet leaders of that time, are conspicuously omitted. Diego Rivera was close friends with Trotsky, and had a personal dislike for Stalin, that’s why the latter is almost never present in his paintings. 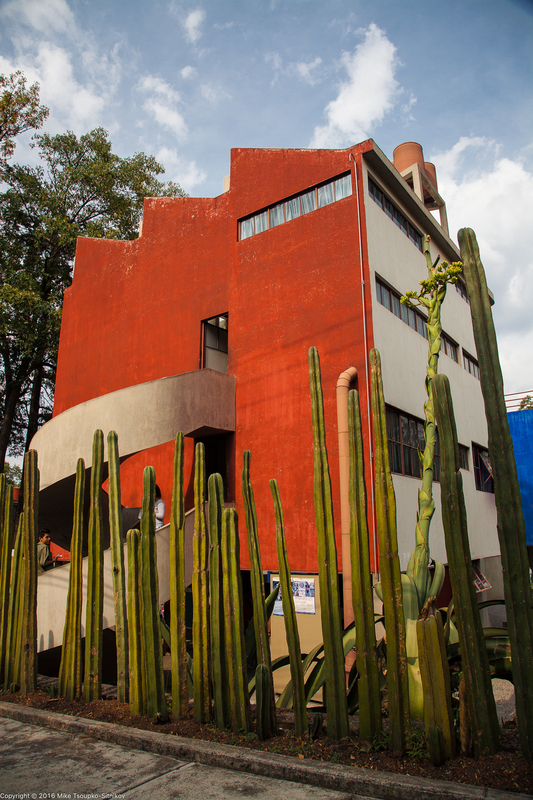 Diego and Frida’s house and studio on is located in Coyoacán, a few kilometers south from the Mexico City center. 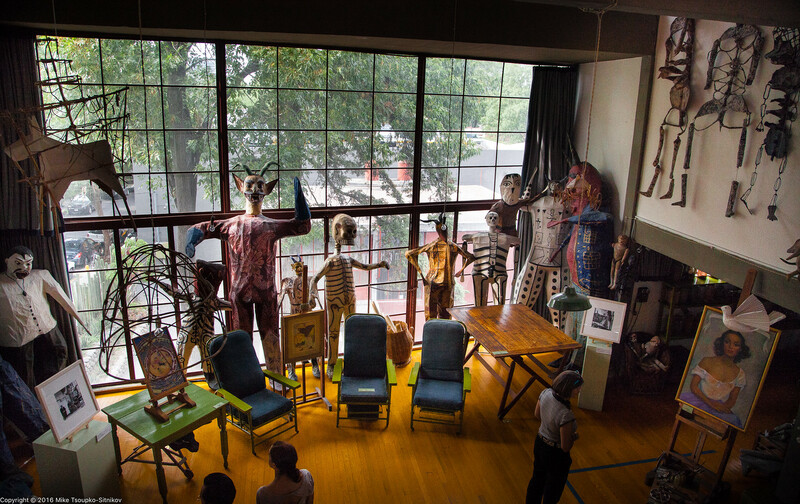 It is now a museum dedicated to their legacy and is open for public. The building itself was quite unusual for the time it was built (around 1930). It was designed by Rivera’s friend, a prominent Mexican painter and architect Juan O’Gorman, on the lot adjacent to Gorman’s house. The latter is also a museum and is open for public. Rivera probably wanted to have a similar house, designed in an out-in-your-face modernistic constructivist style. The house consists of two separate structures, both very narrow at the base and about 3 story high. 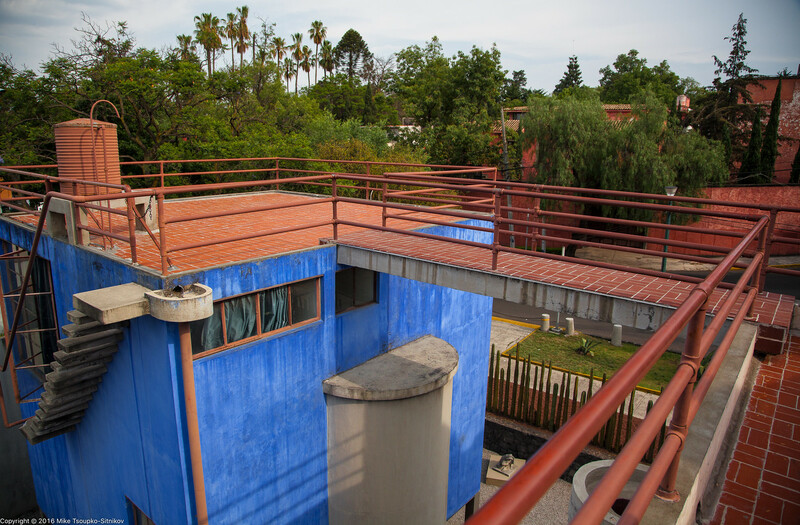 One of them – the red one – was Diego’s part of the house, and the blue one one was Frida’s – painted like the Blue House (Casa Azul) where Frida grew up. The two structure are connected by a flimsy looking walkway at the roof level, and a staircase with a not very safe looking handrail. Why did Diego ask for such design? Why make the communication between the two parts of the house so inconvenient? Given that Frida was partially disabled due to a combination of an illness and a accident, and had difficulty walking, that walkway does not look like a good solution. Maybe Diego wanted to limit the interaction between the two of them, and to be left to his own devices at his part of the house. The house is far from cluttered – it’s rather ascetic. Diego didn’t own too many pairs of shoes or suits or pieces of furniture. 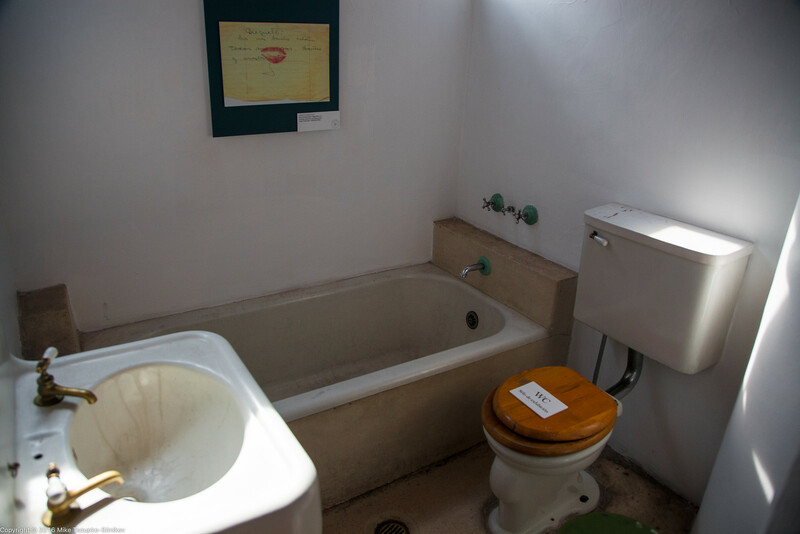 There are lots of his drawings and small painting on the walls, and also many photographs featuring him, Frida and their friends, such as Leon Trotsky and his wife. 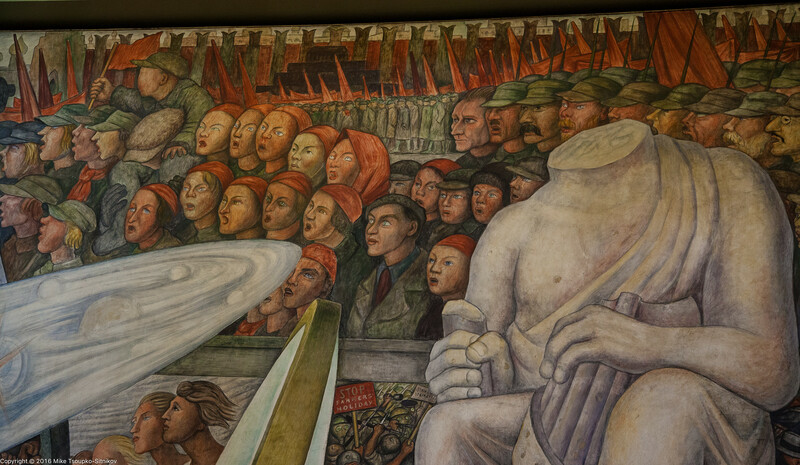 Besides Mexico City, Diego Rivera’s murals can be found in New York, San Francisco and Detroit. 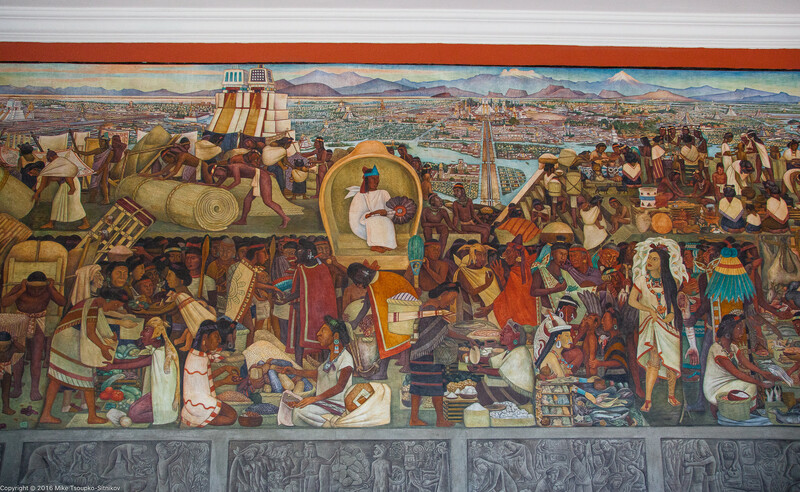 If you know of other places where one find murals by Diego Rivera, please let me know!